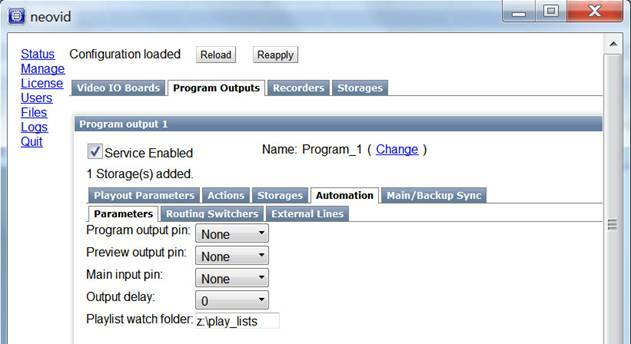 The procedure of uploading playlist files for SL NEO server playout channels allows automatic addition of new playlists to the end of executable playlists on the indicated time. This automation element can be configured from the Administrator Control Panel while the server software is operating. Login to the console is implemented locally from the server, or from any computer in the network by the address http://ip address:7901. You should login to the control console as an administrator. After login to the control console, choose Manage from the console left-hand menu; then select the tab Program Outputs. In the window Program Output 1, choose the tab Automation and then the item Parameters. In the field Playlist Watch Folder, enter the path to the folder from which the playlists will be loaded. Press Apply Changes in the upper section of the control console window. The changed settings will come into effect, the corresponding playback channel will be reloaded, playback on it will be suspended. You should specify the date and time of automatic upload of the playlist file in the Air Manager playlist editor, in the fields from the upper section of the editing window. When you finish editing, the playlist file should be put into the folder indicated in the settings of Administrator Control Panel.